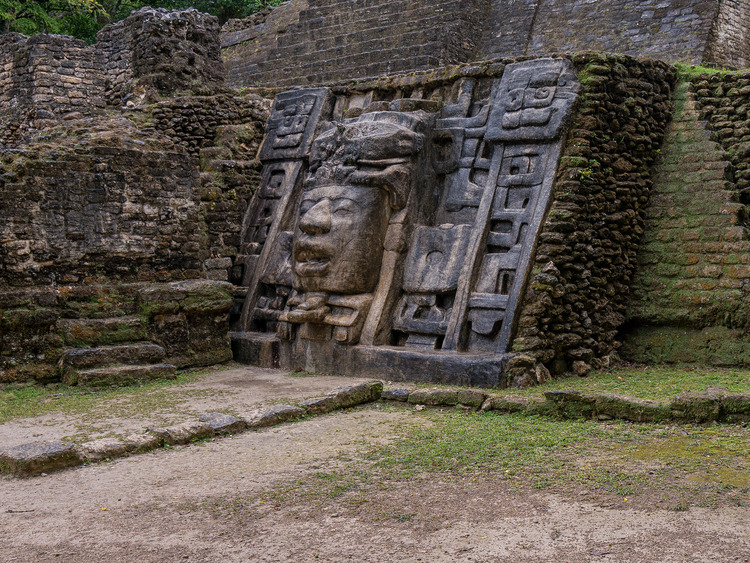 A fantastic excursion which steps back to Mayan times: prepare to admire the ruins in Lamanai with its imposing architecture exuding centuries of history and battles. And that is not all that is on offer: sail along the New River surrounded by the spectacle of the thick rainforest with its countless exotic species. A tour not to be missed! We start our excursion aboard an air-conditioned coach for an hour along the road that crosses the scenic Belize River Valley. Along the way, we cross historic villages that were the original settlements of the British Honduras colony (the ancient name of Belize) and that now form the Belize River Valley as far as the AyinHa Eco Park. Here, we board a boat for a 30-minute cruise on the New River Lagoon with its spectacular forest teeming with exotic birds, deer, iguanas, mangroves and orchids. A marvellous ecosystem formed by the most varied exotic species appears before our eyes as we sail. After the cruise, we reach Lamanai, one of the largest Mayan sites of northern Belize, located approximately 40 km south of the city of Orange Walk. The name Lamanai comes from Lama’anayin which, in the Yucatan Mayan language, means “city of the submerged crocodile” due to the large colony of crocodiles that used to populate the lagoon waters. The ruins of Lamanai, a site inhabited until 1500 BC and once one of the largest sites dedicated to Mayan ceremonies in Mesoamerica, are famous for their majestic architecture surrounded by thick rainforest and for the amazing views that can be enjoyed from the temples of the spectacular New River lagoon, which was of fundamental importance in the everyday life of the Mayans. During the conquest of Yucatan, Spanish missionaries erected two Roman-Catholic churches to convert the population but, in 1640, they revolted against their new masters and destroyed the churches. The British also settled in Lamanai where they built a mill to process sugar. After our visit to Lamanai, we head back to the AyinHa Eco Park. Here we can relax and enjoy what the park has to offer: a two-storey restaurant, bars, toilets and souvenir shops. We also have the chance to try a delicious Belizean dish* cooked in local coconut oil and seasoned to perfection. We will spend around 1 hour at the AyinHa Eco Park so we have all the time in the world to relax and try tropical beverages like the famous Belikin beer produced in Belize and local rum served with fresh coconut milk. We then get back on our coach and head to Belize City driving through the historic villages along the Belize River Valley once again. The excursion takes approximately 6 hours: 2 hour return coach transfer, 1 hour return cruise, 1 hour and a half at Lamanai and 1 hour lunch break. Please consider your physical and health conditions when choosing this tour. The start of the tour is one hour by coach from Belize City. This excursion is not recommended for wheelchair users. We recommend bringing your camera, sunscreen, insect repellent and a poncho in case it rains. We recommend wearing a hat, sunglasses, comfortable clothing and trekking shoes.